IndyCar Series drivers are confident that they can keep the wheels on the pavement in Sunday’s 500. 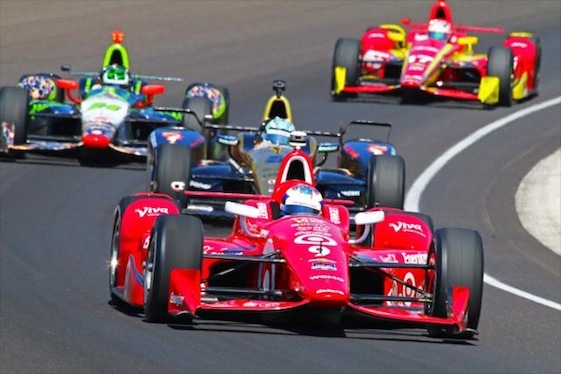 INDIANAPOLIS – Race drivers are supposed to be fearless. But, heading into Sunday’s 99th running of the Indianapolis 500, no one would be surprised if all 33 starters were feeling at least a little trepidation after a series of rather spectacular crashes during practice at the Indianapolis Motor Speedway in the last two weeks. Nothing good happens when race cars become airborne, and that occurred in three separate incidents, with three-time Indy winner Helio Castroneves, Josef Newgarden and Ed Carpenter all taking flight after their cars rolled over and slid backward down the 2 ½-mile oval. Fortunately, the only injury this month came when James Hinchcliffe’s legs were punctured by a piece of broken suspension after he hit the wall last Monday. Fast, efficient work by the track safety team kept the injury from being worse and got Hinchcliffe off to a fast recovery. There have been more crashes in previous years, but the spectacular nature of these incidents has definitely raised questions about safety. Officials of the Verizon IndyCar Series took steps to calm things down by cutting horsepower and slowing the cars by about 6 mph heading into qualifying. But everyone continues to wonder if cars will be flying on Sunday. “It’s a new car and a new (updated aero) kit and we don’t really know what’s going to happen with 33 cars out there on the track,’’ said 2013 race winner Tony Kanaan. “But I want the fans to know that I would be the first person to step out of the car if I thought it was unsafe,’’ Kanaan added. Oriol Servia said, “It’s evident we have a little bit of a hot potato this year. Flying race cars is something nobody wants. But I think the series and the speedway have addressed the problem and come up with a reasonable solution. A year ago, there were 34 lead changes among 11 drivers, with Ryan Hunter-Reay leading the last four laps, holding off runner-up Castroneves by 0.06-seconds, about half a car-length. This year’s race is likely to be just as close. “It’s going to be anybody’s race, like it has been the last five years,’’ Kanaan said. Juan Pablo Montoya, who won here in 2000 and finished fifth a year ago in his debut with Team Penske, said, “There’s eight to 10 cars that can win this race, but it’s harder now because you can’t drive away from anybody. The cars are too even. “But I believe the key here is you’ve got to be fair with everybody. If you touch anybody, you’ll be out of the race, too. Nobody wants to crash. “I’m not any more worried about this race than any other. I think the cars are good and we’ll be just fine if everybody does what they are supposed to do,’’ Montoya added. Castroneves didn’t enjoy his short flight here last week, but it didn’t change the way he is approaching the race and his shot at joining A.J. Foyt, Al Unser Sr. and Rick Mears as a four-time Indy winner.